This year, you may recall, we didn’t hibernate anyone. On the one hand, that might negatively impact fertility; but on the other, all the breedable snakes ate steadily all winter long. And Pretz needed food, I thought, more than a hibernation period. She’s been producing eggs since 2001; except for that first year, when she and her cagemate suffered a Giardia infection, she’s double clutched each year. 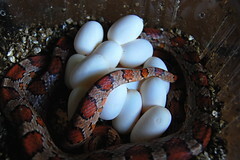 And each year, the percentage of viable eggs in each clutch went down. We simply couldn’t get enough food into her: between hibernation and egg-laying, there were only so many windows during which she could be fed. Maybe six months out of the year. So I decided to feed her up a bit instead. It remains to be seen whether this will have an impact on fertility. If it doesn’t, I really will have to separate her from Trouser this time: no point in knocking her up and leaving her as gaunt as she always is after egg deposition if none of the eggs are any good. But if these eggs are good, they should hatch around the end of July — by which point Pretzel will be ready to lay her second clutch. Best feed the crap out of her in the meantime.